On August 7, 1833, a thirty one family wagon train was organized by Rev. Daniel Parker and traveled from Mt. Vernon, Jefferson County, Illinois to Mexia, Limestone County, Texas. At this time, Texas was part of Mexico and the Mexican Government did not want new religions to be formed. They would not, however, interfere with a church that was already organized. So, just prior to going to Texas, the travelers organized the Pilgrim Primitive Baptist Church. Levi C. Jordan son of Francis Jordan, Sr. 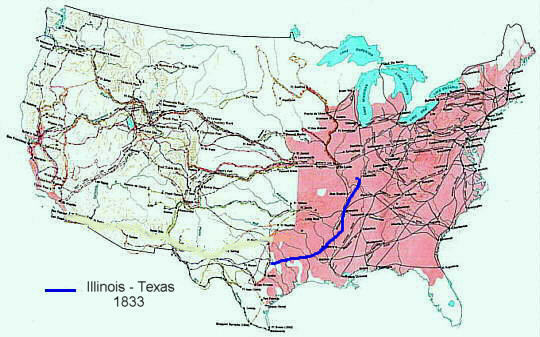 The wagon train crossed the Mississippi River via ferry at Chester, Illinois, through the states of Missouri and Arkansas, to Natchitoches, Louisiana, then to the Sabine Rivervia Gaines Ferry at Pendleton, Texas. It was noted that they were in Pendleton on November 12, 1833, the "Night the Stars Fell". Then to San Augustine, Nacogdoches, Palestine, Elkhart and Mexia in Limestone County, Texas. At Palestine, Texas, Joseph Jordan, Garrison Greenwood, and James Jordan settled at Fr. Houston on their family allotment of land. In 1835, Joseph Neal received his land grant and operated a ferry service across the Sabine River. Francis Jordan, Sr. settled in Nacogdoches, Texas. The Parkers, Frosts, Greenwoods and Jordans began a settlement and built their cabins of pinetrees. It was located on the headright league of Joseph Jordan, as granted June 10, 1835 in Anderson County, Texas. Soon they platted a townsite and named it Houston, Texas. The settlement was surrounded by Indians. The settlers erected a stockade and a fort because they were surrounded by Indians who were continually harassed the settlers. In 1834, Daniel Parker with twenty five families established Old Fort Parker, at Mexia. 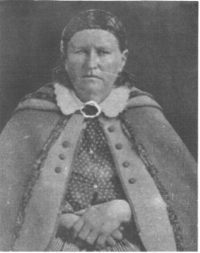 In 1836, a mass attack by several hundred Comanches overran the fort, killing five of the Parker Family and carrying into captivity five persons including Cynthia Ann Parker, then nine years old. She grew up, married a Comanche Chief and lived with the Indians until rescued with her two year old daughter, Prairie Flower, 24 years later in 1860. If you would like to read more about Old Fort Parker, the Commanche raid and Cynthia Parker, click on the "Related Sites" button. with the Comanches some 24 years. In 1836, it was necessary to form the Texas Rangers, near Houston, with three companies of Rangers; one company of twenty five men to be raised by D. B. Frier, one company of twenty five men to be organized by S. M. Parker and the other company of thirty five men organized by Garrison Greenwood. Greenwood also was given "Command of all the frontier forts of Texas". War was declared with Mexico. Santa Anna, the president of Mexico, assumed dictatorial powers. Texas declared her independence and framed a contitution. On March 6, 1836, in the Battle of the Alamo, at San Antonio, General Santa Anna stormed the Alamo and defeated Captain Travis. Due to General Sam Houston's orders, the settlers were to cross the Sabine River, Texas and to get into Louisiana to claim protection of the US. The settlers reached the Neches River, between Palestine and Nacogdoches and found the river flooded. The settlers were in quite a predicament with the Mexican Army behind them, the river flooded and the Indians in front of them. After fording the Neches River, the settlers camped on the Angeline River, near Nacogdoches. The settlers were finally scattered in retreat to San Augustine to Nacogdoches, on the Red River, Texas. They learned of their independence in the State of Texas on April 21, 1836, at the Battle of San Jacinto. In 1838, Rev. Daniel Parker established the first Baptist Church in the state of Texas. It was a crude, single room, twenty foot square sstructure and the doors and windows were protected by heavy shutters with loopholes and the floor was made of clay. Daniel Parker and Garrison Greenwood were responsible in establishing nine Baptist Churches in Texas.